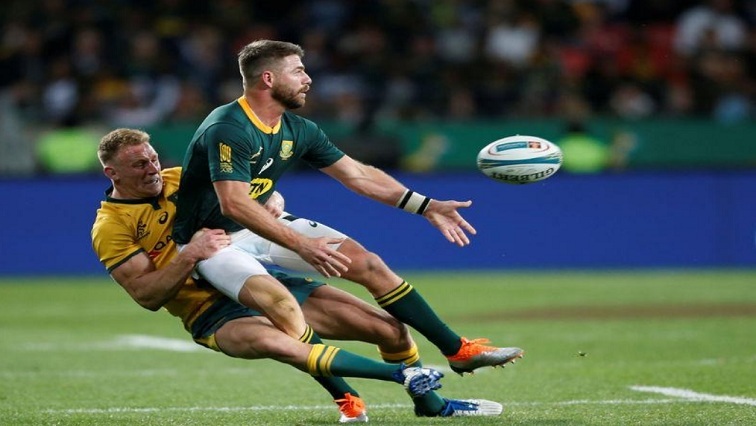 Erasmus adds experience to South Africa backline - SABC News - Breaking news, special reports, world, business, sport coverage of all South African current events. Africa's news leader. Australia's Reece Hodge challenges Willie le Roux. South Africa coach Rassie Erasmus has added experience in key kicking positions in his backline for the test against France in Paris on Saturday with the inclusion of England-based duo Willie le Roux and Faf de Klerk. The pair missed last weekend’s 12-11 loss to England at Twickenham as the fixture fell outside the international window, but have been drafted into the side along with lock Franco Mostert, who replaces the injured Eben Etzebeth. Le Roux and De Klerk, who have 70 caps between them, replace Damian Willemse and Ivan van Zyl, who drop out of the match-day 23. “It’s good to have the experienced players back in the starting team for France,” Erasmus said in a media release from South Africa Rugby on Thursday. Erasmus added that Etzebeth was not rushed back into service after his ankle injury against England with the final two tests on tour against Scotland and Wales in mind. “We believe it would be better not to rush Eben back as we still have two tests left on the tour after the match against France,” he said. The Boks have won their last six tests against the French, including their previous two meetings in Paris, the last of which was a narrow 18-17 success in 2017. They have had an inconsistent year, though, winning five of their 11 tests, include an away victory over New Zealand in the Rugby Championship. Replacements: 16-Bongi Mbonambi, 17-Thomas du Toit, 18-Vincent Koch, 19-RG Snyman, 20-Francois Louw, 21-Embrose Papier, 22-Elton Jantjies, 23-Cheslin Kolbe. This entry was posted on 08 Nov 2018,07:10PM at 7:10 PM and is filed under Sport, Rugby. You can follow any responses to this entry through the RSS 2.0 feed. Both comments and pings are currently closed.